The CAP Barbell 40 Pound Dumbbell Set is not only convenient, but a great bit of workout equipment for both beginners and advanced fitness enthusiasts. 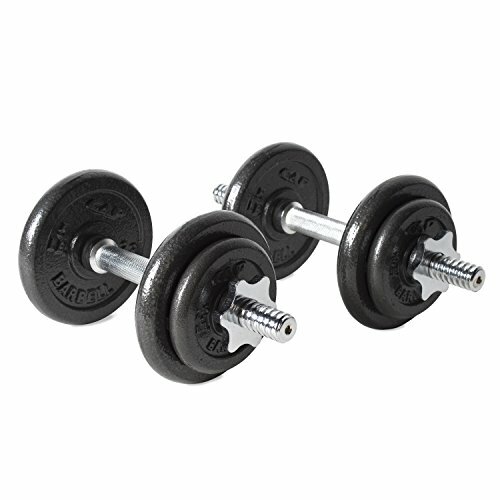 This product features different plate weights that come in a plastic case, and dumbbells that can be adjusted according to the user’s weight preference. Equipped with four 2.5 pound plates and four 5 pound plates, this product has plenty of options to give you the workout you desire. There are also two handles and two collars that allow you to workout with a variety of interchangeable settings at once without having to purchase multiple sets. A plastic carry case measuring just 20 inches long by 9 inches wide is included to ensure that the weights stay organized and easily accessible while making it easy to carry your weights wherever you go. Other great features of this kit are the ergonomic grips, the rubber trim collars, and the comfort handles that ensure that the user can achieve a high-performance workout in comfort. Made of durable cast iron, the plates feature a semi-gloss finish to help maintain a rust and maintenance free future. However, this product contains one or more phthalate chemicals that are known to the state of California to cause birth defects and other reproductive harm. If uneasy with this fact, the consumer may return the product for a full refund that includes the shipping cost for both the receipt and the return of said product within 15 days of their receipt. A plastic carry case measuring just 20 inches long by 9 inches wide is included to ensure that the weights stay organized and easily accessible while making it easy to carry your weights wherever you go. Other great features of this kit are the ergonomic grips, the rubber trim collars, and the comfort handles that ensure that the user can achieve a high-performance workout in comfort. Made of durable cast iron, the plates feature a semi-gloss finish to help maintain a rust and maintenance free future. However, this product contains one or more phthalate chemicals that are known to the state of California to cause birth defects and other reproductive harm. If uneasy with this fact, the consumer may return the product for a full refund that includes the shipping cost for both the receipt and the return of said product within 15 days of their receipt.